While fans around the world slave over their own video game creations, Hasbro has teamed up with the mobile masters at Gameloft to deliver official games based on My Little Pony: Friendship is Magic, with the first offerings due out in time for Hearth's Warming Eve, er, Christmas. 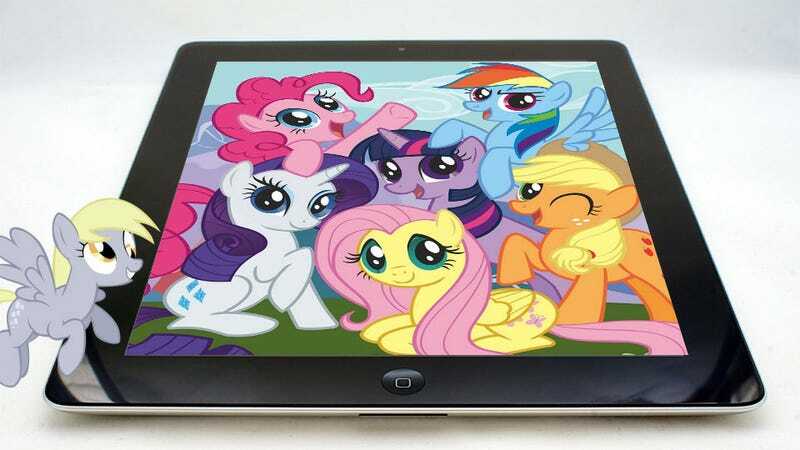 While there have been official My Little Pony video games in the past, Gameloft's newly-announced partnership with Hasbro marks the first time the Friendship is Magic television show version of the characters will be appearing in video game form. No, I'm not counting My Little Pony: Twilight Sparkle, Teacher for a Day; that's an educational app. It's supposed to be an educational app, at least. "Hasbro's position as a leading branded play company makes this a very strong alliance for Gameloft," said Gonzague de Vallois, Senior Vice President of Publishing at Gameloft via official press release. "The opportunity to collaborate on such globally recognized brands such as My Little Pony and Littlest Pet Shop not only allows us to build a unique and immersive universe for the characters we've all grown to love, but to take the much-adored franchises to the next level of digital play." Oh yeah, they're doing Littlest Pet Shop too. Sorry, slipped my mind. Gameloft is one of the better mobile platform developers, so I trust they'll bring quality work to iOS, Android and other mobile platforms when the time comes. Besides, with their penchant for aping popular titles perhaps we'll finally get a working version of Mares of War.